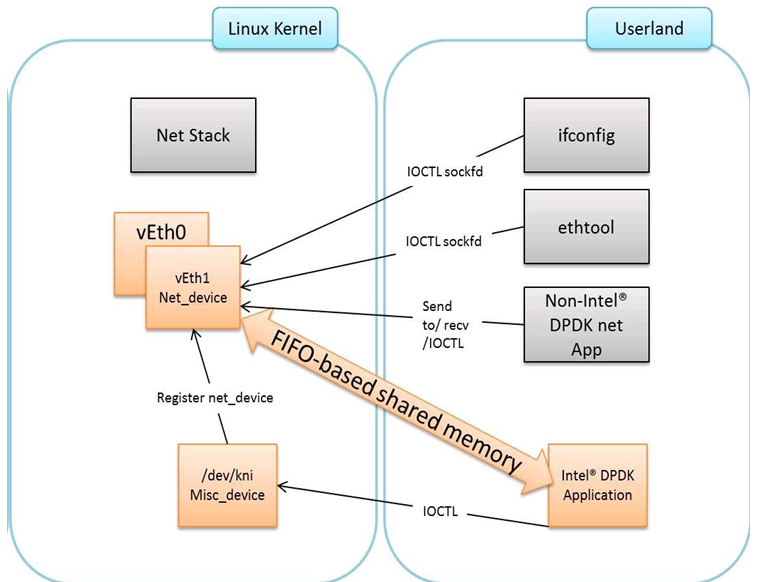 The components of an application using the DPDK Kernel NIC Interface are shown in Fig. 34.2. The KNI kernel loadable module rte_kni provides the kernel interface for DPDK applications. When the rte_kni module is loaded, it will create a device /dev/kni that is used by the DPDK KNI API functions to control and communicate with the kernel module. single    Single kernel thread mode enabled. multiple  Multiple kernel thread mode enabled. off   Interfaces will be created with carrier state set to off. on    Interfaces will be created with carrier state set to on. Loading the rte_kni kernel module without any optional parameters is the typical way a DPDK application gets packets into and out of the kernel network stack. Without any parameters, only one kernel thread is created for all KNI devices for packet receiving in kernel side, loopback mode is disabled, and the default carrier state of KNI interfaces is set to off. The lo_mode_fifo loopback option will loop back ring enqueue/dequeue operations in kernel space. The lo_mode_fifo_skb loopback option will loop back ring enqueue/dequeue operations and sk buffer copies in kernel space. If the lo_mode parameter is not specified, loopback mode is disabled. To provide flexibility of performance, the rte_kni KNI kernel module can be loaded with the kthread_mode parameter. The rte_kni kernel module supports two options: “single kernel thread” mode and “multiple kernel thread” mode. For optimum performance, the kernel thread should be bound to a core in on the same socket as the DPDK lcores used in the application. This mode will create a separate kernel thread for each KNI interface to receive data on the kernel side. The core affinity of each kni_thread kernel thread can be specified by setting the core_id and force_bind parameters in struct rte_kni_conf when each KNI interface is created. Multiple kernel thread mode can provide scalable higher performance if sufficient unused cores are available on the host system. If the kthread_mode parameter is not specified, the “single kernel thread” mode is used. The default carrier state of KNI interfaces created by the rte_kni kernel module is controlled via the carrier option when the module is loaded. If carrier=off is specified, the kernel module will leave the carrier state of the interface down when the interface is management enabled. The DPDK application can set the carrier state of the KNI interface using the rte_kni_update_link() function. This is useful for DPDK applications which require that the carrier state of the KNI interface reflect the actual link state of the corresponding physical NIC port. If carrier=on is specified, the kernel module will automatically set the carrier state of the interface to up when the interface is management enabled. This is useful for DPDK applications which use the KNI interface as a purely virtual interface that does not correspond to any physical hardware and do not wish to explicitly set the carrier state of the interface with rte_kni_update_link(). It is also useful for testing in loopback mode where the NIC port may not be physically connected to anything. If the carrier parameter is not specified, the default carrier state of KNI interfaces will be set to off. Before any KNI interfaces can be created, the rte_kni kernel module must be loaded into the kernel and configured withe rte_kni_init() function. The KNI interfaces are created by a DPDK application dynamically via the rte_kni_alloc() function. 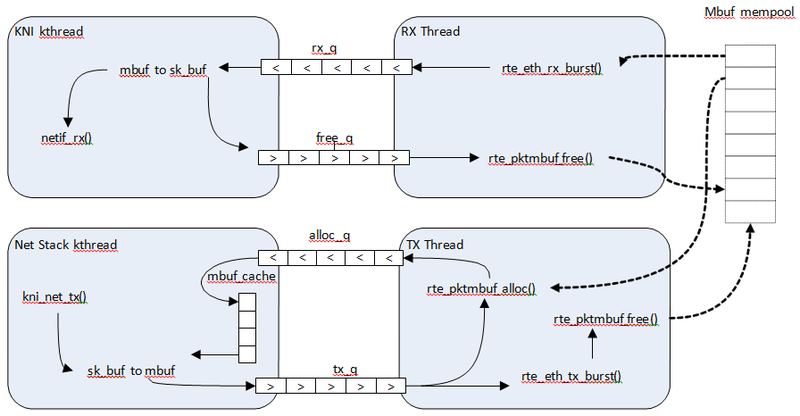 The struct rte_kni_conf structure contains fields which allow the user to specify the interface name, set the MTU size, set an explicit or random MAC address and control the affinity of the kernel Rx thread(s) (both single and multi-threaded modes). By default the KNI sample example gets the MTU from the matching device, and in case of KNI PMD it is derived from mbuf buffer length. The struct rte_kni_ops structure contains pointers to functions to handle requests from the rte_kni kernel module. These functions allow DPDK applications to perform actions when the KNI interfaces are manipulated by control commands or functions external to the application. For example, the DPDK application may wish to enabled/disable a physical NIC port when a user enabled/disables a KNI interface with ip link set [up|down] dev <ifaceX>. The DPDK application can register a callback for config_network_if which will be called when the interface management state changes. Called when the management state of the KNI interface changes. For example, when the user runs ip link set [up|down] dev <ifaceX>. Called when the user changes the MTU size of the KNI interface. For example, when the user runs ip link set mtu <size> dev <ifaceX>. Called when the user changes the MAC address of the KNI interface. For example, when the user runs ip link set address <MAC> dev <ifaceX>. If the user sets this callback function to NULL, but sets the port_id field to a value other than -1, a default callback handler in the rte_kni library kni_config_mac_address() will be called which calls rte_eth_dev_default_mac_addr_set() on the specified port_id. Called when the user changes the promiscusity state of the KNI interface. For example, when the user runs ip link set promisc [on|off] dev <ifaceX>. If the user sets this callback function to NULL, but sets the port_id field to a value other than -1, a default callback handler in the rte_kni library kni_config_promiscusity() will be called which calls rte_eth_promiscuous_<enable|disable>() on the specified port_id. In order to run these callbacks, the application must periodically call the rte_kni_handle_request() function. Any user callback function registered will be called directly from rte_kni_handle_request() so care must be taken to prevent deadlock and to not block any DPDK fastpath tasks. Typically DPDK applications which use these callbacks will need to create a separate thread or secondary process to periodically call rte_kni_handle_request(). The KNI interfaces can be deleted by a DPDK application with rte_kni_release(). All KNI interfaces not explicitly deleted will be deleted when the the /dev/kni device is closed, either explicitly with rte_kni_close() or when the DPDK application is closed. Fig. 34.3 shows a typical scenario with packets sent in both directions. The DPDK TX thread dequeues the mbuf and sends it to the PMD via rte_eth_tx_burst(). It then puts the mbuf back in the cache.